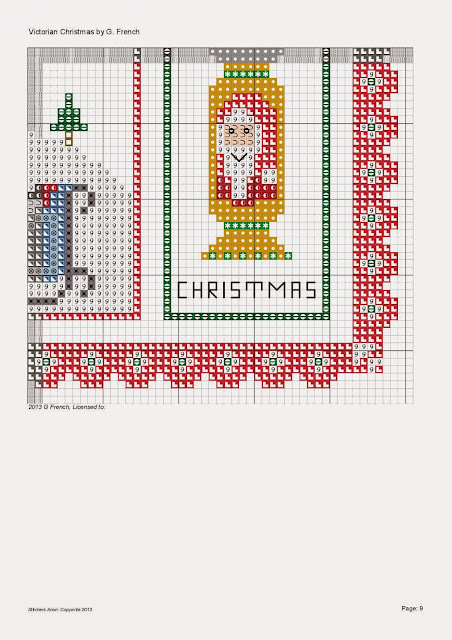 Stitchers Anon: Final Part and Happy Christmas! Final Part and Happy Christmas! I hope this finds you hearty and healthy! We did it. We finally got our tree up! So it is starting to feel a lot like Christmas! I have also been busy buying things to put into the Christmas Giveaway (link on my sidebar...go and comment! I promise it will be a doozie!) and I gave myself two days off to do Christmassy things and ended up designing three new charts, all featuring Holmsey hare and Fergus the deer! I don't think I have quite got the idea of the days-off! This will be my last post pre-Christmas. I haven't finished my Victorian Christmas sampler but will do over the next few days. However I am not going to keep you waiting until I have finished for you to have the last piece. The other sections will be kept on the blog; the tab is on the top of the home page of my blog and you can just click it to download the sections. This week features a cracker with Father Christmas on. Santa, despite what the bit corporate businesses tell you, was not invented by a certain soft drinks company. Santa Claus is Saint Nicholas, a gift bringer. You can see Father Christmas's full history here. Like many of our Christmas traditions, there are combinations of pagan and Christianity in St Nick as we know him now; he is sometimes shown wearing green, and of course we now see him in red. Christmas Crackers were developed by Tom Smith in 1837 and were based on how his bonbon sweets were wrapped in paper and then, when he heard the logs crackling in his fire, he decided to add the bang! So here we have Santa and a Cracker...enjoy! I will love you and leave you now and see you the day after Christmas when I will draw the winner of the Christmas giveaway. Have a wonderful, peaceful and joyous Christmas. Keep safe and well and see you all again soon. Your home look wonderful and cozy! Have a wonderful Christmas, your home looks so inviting and full of Christmas cheer. Thank you again for the sampler. Your fireplace and tree are the perfect combo! HOW picturesque! Your home looks lovely. Merry, Merry Christmas to you! The whole SAL piece is just lovely. Thank you again. I now see the model for the fireplace! Enjoy lots of fun times over the festive season in your beautifully finished sitting room, it certainly looks nice and cosy. The tree looks wonderful with all the handmade goodies on it. Wow! Your tree is gorgeous! And the fire place. Interesting bit about crackers. Will try to remember in case it comes up in any of the quizzes. Such a beautiful tree Gaynor!! I love the stitched ornaments you have on your tree. It definitely looks like Christmas in your home!! What a beautiful room for relaxing and enjoying the warmth and love found there. Enjoy your holidays! What a lovely tree. Have a wonderful Christmas! Thank you again for this SAL. I am way way behind but still working on it. I need to post an update about what's been going on, but I just wanted to tell you hello and Merry Christmas!!!! I hope you and your family have a wonderful holiday and an excellent New Year!!!! Merry Christmas to you my friend! Your tree and living room are just delightful to see--so cozy and inviting! Thanks for sharing... I hope to get some pics up on my blog end of the week. Blessings to you and yours! Hugs! Merry Christmas and a very Happy New Year to you and your family! Your home is beautiful and oh so cozy looking ~ I love your fireplace! Merry Christmas! Your tree is beautiful. I'd love to sit in front of that roaring fire and stitch!